very strict controls for each new batch. Rembrandt pastels have for many years been the most commonly used pastels in the world, in part due to their unique characteristics. 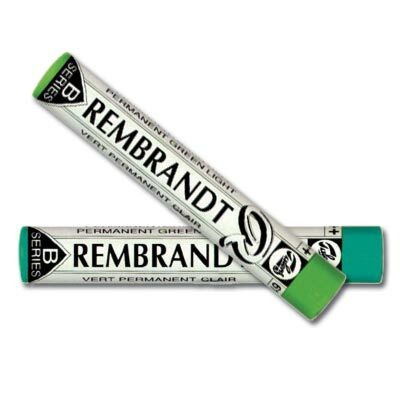 The main constituents of Rembrandt pastels are pigment and kaolin. The kaolin, also known as china clay or pipe clay, holds the pigment together in the pastel and gives the colours their great covering capacity. The softness has been chosen so that the pastels can easily transfer their colour while at the same time not fall apart or turn to powder. COLOUR INTENSITY, COLOUR PURITY AND LIGHTFASTNESS. The range is free of pigments based on heavy metals such as cadmium, lead and cobalt. code ,5. In the case of pure Lemon yellow the label says 205,5. The intermediate shade with black is indicated by 205,3 and the intermediate shades with an increasing amount of white with a series with increasing numbers. In this case: 205,8, 205,9 and 205,12. Some colours also have the gradations ,7 and ,10. The extra soft white pastel with the name White Super Soft (colour number 101,5) is for applying light accents in the final layers.